As of 2013, the 6,558 state legislative districts in the U.S. are comprised of 4,629 lower/house chambers and 1,929 upper/senate chambers. Of the total state legislative districts, 1,257 are 100-percent urban (every census block comprising the district is urban), 19 are 100-percent rural, and 927 are less than 1-percent urban. Use the interactive table in this section to view, rank, compare state legislative districts by rural and urban population and geographic area. Use GIS tools to visually examine U.S. or state by state legislative district patterns such as percent population urban. 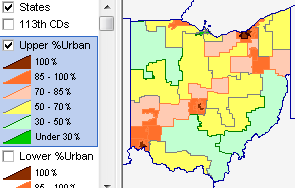 The percent Census 2010 urban population by Ohio state legislative district is shown in the maps presented below. The legend at the left of each map shows the percent urban population and corresponding color/pattern. These 2013 boundaries reflect Census 2010 redistricting. State legislative district shapefiles with integrated demographics are available from ProximityOne. Wide-ranging richer demographic-economic data are available. These map views were developed using the CV XE GIS software. Use the GIS resources described below to create/view state legislative district reference maps (any/all states, zoom to one district). There is one row for each state legislative district. - click District Type selector below table and choose L; table refreshes.  Use the U.S. national scope State Legislative District GIS Project on your computer.  Create reference or thematic pattern maps; integrate your data.  ProximityOne User Group (join now, no fee) members may download/use at no fee.  Unzip the State Legislative District project using the link provided in the User Group section to folder c:\sld\.  Start the CV XE GIS software (any version works). The above start-up view shows a zoom-in to the Dallas, Texas area. A query has been places on the SLDU 2012 and SLDU 2010 layers to show/compare Texas senate district 016 in 2010 and 2012 vintages. See more about SLD vintages and related issues. The GIS project includes shapefiles (shown in legend panel in above view) listed below. SLD shapefiles do not include subject matter; SLD shapefile fields include state code and SLD code.